Cape Dutch style building is the original Slave quarters on the Farm built in 1723. 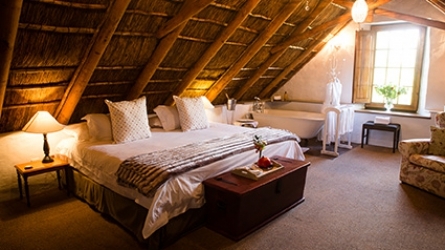 The beautiful thatch roof encompasses 4-Rooms and two communal lounges, complete with a private courtyard and is situated next to the salt-water pool. 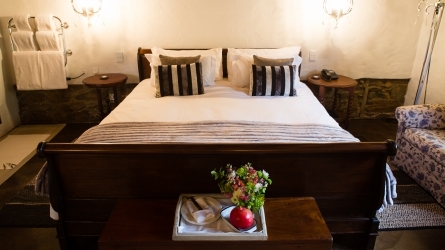 Room 1 – Is downstairs off the communal Lounge area and has a ceiling fan, king size Sleigh bed, coffee & tea facilities, percale linen and underfloor heating, large shower and en-suite toilet. Beautiful orchard views. Room 2 – Is downstairs off the communal Lounge area and has a ceiling fan with a king size bed (can also be made-up as twin beds) as well as single bed for child or 3rd person, coffee & tea facilities, percale linen, underfloor heating, en-suite bathroom with claw foot bath and hand shower. Beautiful orchard view. 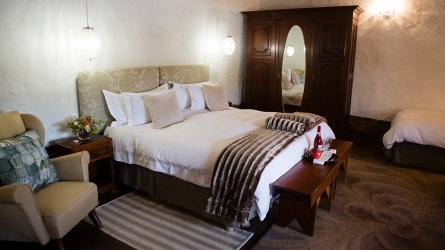 Room 3 – Is on the second floor off the upstairs communal Lounge with thatch roof and air-conditioning, king size bed (can also be made up as twin beds), coffee & tea facilities, percale linen and beautiful Victorian bath with hand shower in the main bedroom and en-suite toilet. 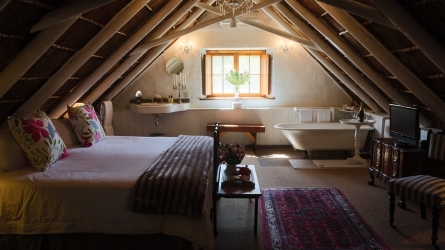 Room 4 – Is on the second floor off the upstairs communal Lounge with a mountain facing view and a thatch roof and air-conditioning, king size bed, coffee & tea facilities, percale linen and beautiful Victorian bath with hand shower in the main bedroom and en-suite toilet. Orchard view.